This wonderful sailing area will suit more experienced crews who relish the challenge of fresh sailing winds and quieter, off-the-beaten-track anchorages. From our base in Loutraki on the idyllic holiday island of Skopelos, the Pelion Route ventures west into the sheltered Gulf of Volos, in the shadow of the Pelion peninsula and blessed with safe anchorages and timeless fishing villages. We visit sleepy Paleo Trikeri and historic Pegadi, from where Achilles set to sail for Troy. Our route back takes us to Koukounaries, famed for one of the Mediterranean’s best beaches. Our Sporades Route heads east from Skiathos and explores outlying islands such as Alonissos, with its scenic harbours at Patitiri and Steni Vala. We head for the uninhabited islands of Peristeri, Xero or, weather permitting, Pelagos – also known as Kyra Panaghia, with its single resident and herds of wild goats. Friday: Arrivals and departures – Fly UK to Skiathos. And Transfer to our base Loutraki on Skopelos. Saturday:Patitiri (18 nm) – Capital of Alonissos and an enchanting and timeless harbour. Time to enjoy the punch party on the quay before an evening meal in a traditional taverna. Sunday: Kyra Panagia (19 nm) – chance to escape to the beautiful island inhabited by the residents of the monastery. We anchor for the night under a star filled sky in Planitis bay.chance to escape to the beautiful island inhabited by the residents of the monastery. Monday: Steni Vala (4 nm) – a pretty fishing village with a choice of good tavernas ashore. Tuesday: Skopelos Town (12 nm) – Capital of the island of the same name and a charming harbour town rising amphitheatrically from the scenic harbour. 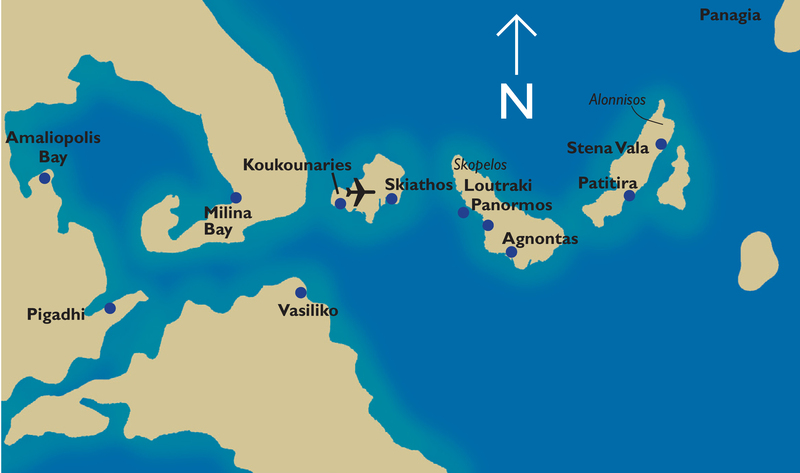 Thursday: Loutraki (10 nm) – a swimming stop and a leisurely sail back to our base. Time for drinks on board before a last night out in this real party town. Friday: Arrivals & departures - Arrivals & departures. Two-week flotilla on independent sailing with rendez-vous at Skiathos. Saturday: Koukounaries (12nm)– After a morning briefing, set sail to the lively island of Skiathos. Plenty of time to anchor on one of the fantastic beaches before our punch party and dinner ashore. Sunday: Paleo Trikeri (25 nm) – Sail into the gulf of Volos and to this gem of an island, Paleo Trikeri. Stop at ‘Donkey Island’ to say hi! Monday: Amaliopoli(10 nm) – The small town of Amaliopoli has some great tavernas to enjoy after a day on the water. Tuesday: Orei, Evia (18 nm) – sail to the north coast of Evia island and visit this lively little resort with its ancient Acropolis guarding the harbour. Thursday: Loutraki – a swimming stop and a leisurely sail back to our base. Available through Sunscape Yachting are regular flights into Skiathos departing on Fridays from London Gatwick, Birmingham, Stansted and Manchester. Flight time 3 hrs 25 mins.